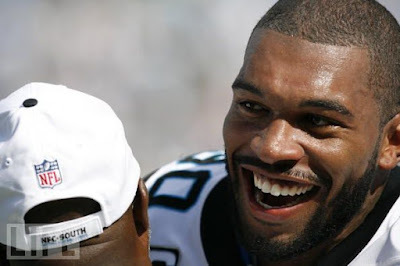 I know it's not very divalike behavior, but I love Julius Peppers and I used to love Panthers football. It has just been brought to my attention that Julius Peppers, the light of my Sundays for the last 7 years, will likely not be returning to the Panthers next season. Look at that smile people! How can he not make you feel like it's all going to be ok?! Because Julius Peppers > Carolina Panthers, I am going to root for his new team. That will probably involve a lot of research and learning of names, so lets just hope that I don't get overwhelmed and have to retire as a fair-weather sports fan for good! In other sports news, I, arguably the most un-athletic person in the world, appear to have a sports injury. What kind of karmic b.s. is this! what is your injury, mamacita? These cheats for ps3 and xbox can be used easily this site is very helpful for me.